Note: Due to the popularity of the response from members of the US Armed Forces, the below offer is no-longer available. Obihai have a limited number of manufacturer-certified, reconditioned OBi110 units which we can provide free of charge, to members of the United States Armed Forces (Army, Navy, Marine Corps, Air Force & Coast Guard). This offer is good only until the limited supply of OBi110 units are consumed. Obihai will post a notice on the OBiTALK forum and Facebook page when the currently available supply is consumed. There is a limit of one (1) OBi110 per person or family. Please allow 4-8 weeks for processing. The OBi202 2-port VoIP phone adapter with router supports up to 4 VoIP services, including Google Voice™ with network and application extensibility via integrated USB port. Obihai, the customer-top-rated manufacturer of VoIP phone adapters for SIP and Google Voice™, has just released the OBi202 two-port VoIP telephone adapter with integrated router and USB port. The OBi202 is for sale now at www.Amazon.com and available to service providers for mass-deployment. With the previously announced End-of-Sale for the Cisco-Linksys SPA2102 and PAP2T, the OBi202 is well-equipped to replace these highly-regarded ATAs for both value added reseller (VAR) and service provider deployments. 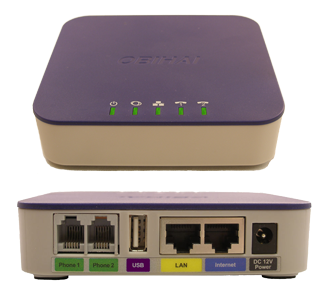 The OBi202 is targeted at Internet phone service providers world-wide, as well as power-users of Google Voice™ and literally hundreds of Bring Your Own Device SIP services. The OBi202's innovation and sophistication in the areas of speech technology, voice traffic prioritization, call management and ease of set-up are catalysts that will ignite excitement among consumer and small business users who want the best product for their VoIP communication needs. “We are extremely excited to bring the OBi202 to market and support all the customers using the device,” said Jan Fandrianto, President and CEO of Obihai Technology, and inventor of the first VoIP phone adapter. “Home and small businesses users of the OBi202 will be impressed with its innovative features, attractive design, excellent voice quality and reliability,” Fandrianto said. The OBi202 is priced at $99.99 and is available today at Amazon, for a promotional price of $74.99 with free shipping. Over the next few months, more stores and on-line merchants are expected to carry the OBi202. Resellers and service providers should contact Obihai directly at: sales@obihai.com for information on sourcing and deployment of the OBi202. - If the called phone is idle, it will ring normally with a Caller-ID indicating the call is coming from the phone connected to the other phone port of the same OBi202. - If the called phone is already on a call, the calling phone can automatically join the call. - If the called phone is on-hook with a call holding, the calling phone can pick up / resume the call. - If the called phone is ringing, the calling phone will pick-up and answer the incoming call. The OBi202 USB port is designed to serve multiple purposes. Using the soon to be available OBiWiFi Wireless Adapter, the OBi202 can be placed anywhere within range of an 802.11b/g/n access point. Or, the USB2.0 port can be connected to a storage device to enable local and remote access of digital files via the Internet by authorized users. Complimentary to ZT, Obihai have a specialized web-portal for VoIP service providers. Via the portal, service provider support engineers can access each device individually to troubleshoot and configure specific parameter settings as well as set-up and perform loop-back calls and other tests without requiring the end user subscriber’s assistance or intervention. Available at Amazon.com Click here to visit the Obihai storefront. Please contact sales@obihai.com to contact Obihai about becoming a partner service provider or reseller. A comprehensive OBi202 technical data sheet is available: Click Here. * Google previously announced calls to the USA and Canada will be free through 2012.
iPhone, iPad and iPod touch are trademarks of Apple Computer, Inc.
Google Voice, Google Apps, Gmail, Google Talk, Google Chat are trademarks of Google Inc.
Other company names mentioned herein are the trademarks or service marks of their respective owners.